access resources like company apps and email. Configuration of terms and conditions is optional. You can create multiple sets of terms and assign them to different groups, such as to support different languages. by using Intune as described in this article. Complete these steps to create terms and conditions. The display name and description are for administrative use while terms properties are displayed to users in the Company Portal. 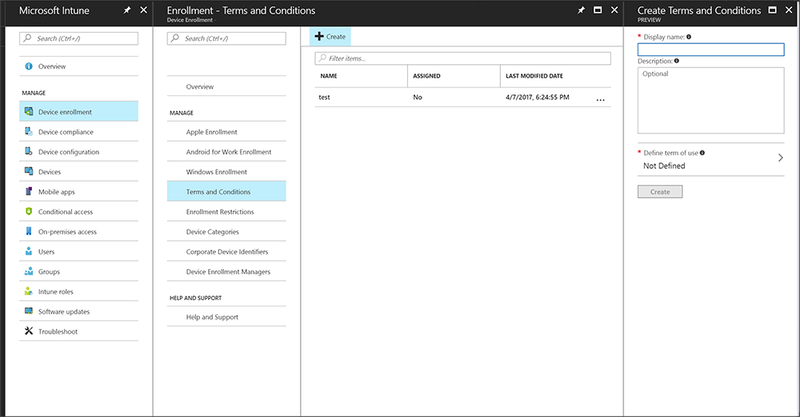 On the Intune pane, choose Device enrollment > Terms and Conditions. Display name: The name for the terms in the Azure portal. Users don't see this name. Description: Optional details that help you identify this set of terms in the Azure portal. Title: The name for your terms that users see in the Company Portal above the Summary. Terms and Conditions: The terms and conditions that users see and must either accept or reject. The following example shows the Title and Summary of Terms in the admin console and Company Portal. 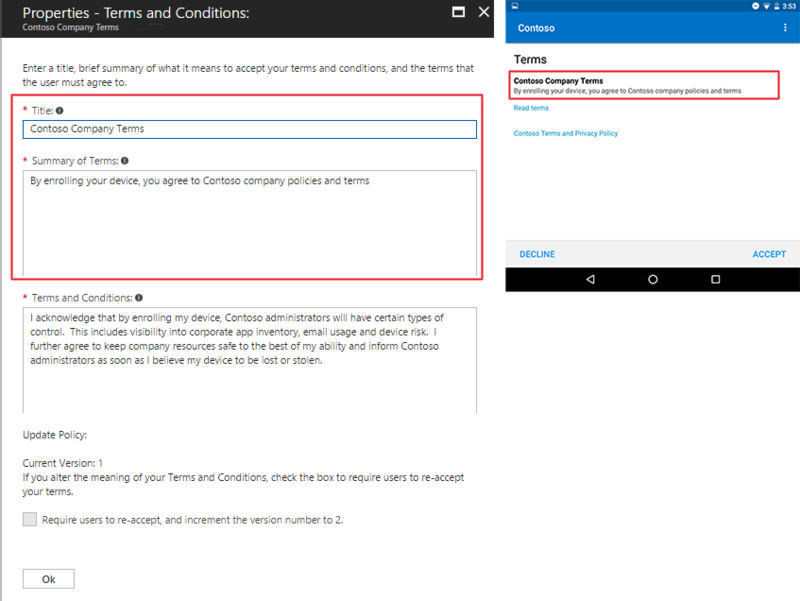 The following example shows the terms and conditions in the admin console and the Company Portal. You can assign terms and conditions to groups of user who must accept them before using the Company Portal. In the Azure portal, choose Device enrollment, and then choose Terms and Conditions. In the list of terms and conditions, choose the terms you want to assign > Manage > Assignments. Choose Select groups to include > choose the groups you want to assign the terms > Select. Dynamic groups can't be assigned Terms and Conditions. In the Assigned Groups pane, choose Save. The terms and conditions are now assigned to users in the selected groups. Users will be prompted to accept terms the next time they access the company portal. The terms and conditions need to be accepted only once. Users with multiple devices don't have to accept on each device. In the Azure portal, choose All Services > Monitoring + Management > Intune. In the list of terms and conditions, choose the terms you want to view acceptance for > Acceptance Reporting. require users to accept the new terms and conditions Keep the current version number if, for example, you're fixing typos or changing formatting. 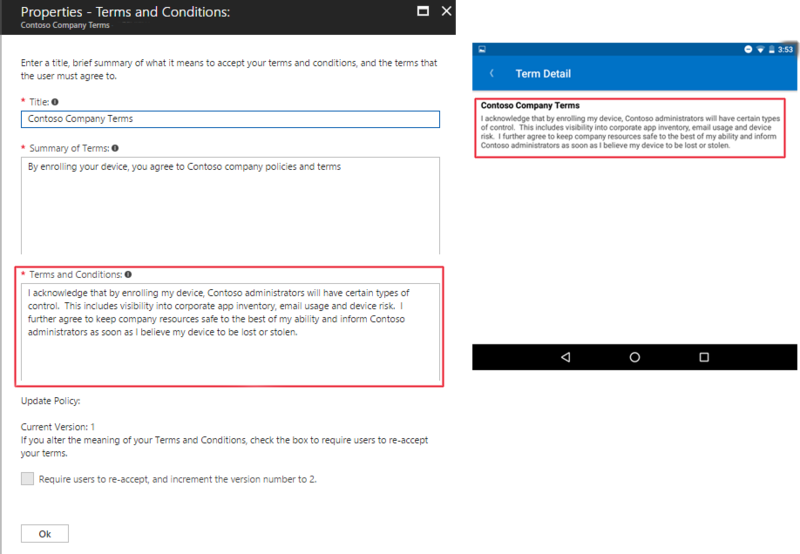 On the Intune pane, choose Device enrollment > Terms and Conditions > choose the terms and conditions you want to modify > Properties. Users only have to accept updated terms and conditions once. Users with multiple devices don't have to accept terms and conditions on each device.